Ground Penetrating Radar (GPR) is widely used to observe the basal topography of glaciers and ice sheets. 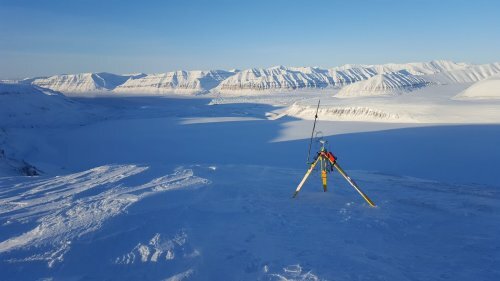 The SIOS funded project “Structure of a surge type glacier from multi-offset ground penetrating radar (SumoGPR)" set out to observe the bed topography of Von Postbreen, a polythermal surge-type glacier in Svalbard. This project was lead by Richard Delf, a PhD candidate in glaciology and geophysics at the University of Edinburgh, supported by his supervisor, Dr. Robert Bingham. The aim of the fieldwork was to undertake ground penetrating radar studies on Von Postbreen, a surge-type glacier previously confluent with Tunabreen, Tempelfjorden. The glacier is polythermal, meaning there is ice at melting point within the deeper areas of the ice. This water content exerts a significant control on ice flow and dynamics, and is a result of the internal thermal structure, believed to be linked to surge cycles observed in many Svalbard glaciers. 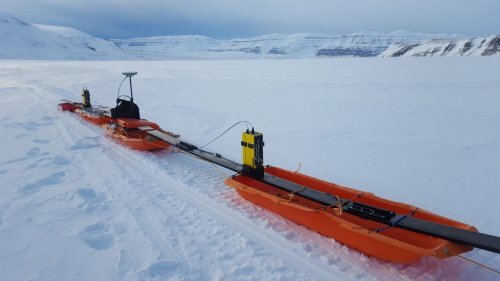 This provides an interesting test-site for the use of surface based geophysical techniques to characterise the englacial and subglacial properties of glaciers further afield. The first day of fieldwork was to set up a GPS base station on the nearby Pyzybyllokfjellet. This would provide us with accurate real-time corrections to the GPS system feeding the radar system on the glacier below. This additionally gave us an excellent view over the glacier and the nearby surging Tunabreen. We used a GPR system at 25 MHz central frequency to survey much of the lower area of the glacier, with a centreline extending the full length of the glacier up to the ice divide above Potpeshniggbreen, at approximately 700 m above sea level. The antennas were mounted on plastic pulks and towed behind a snowmobile, allowing the collection of 40 km of common offset data. This data allows us to firstly observe the bed topography of Von Postbreen, with the lower area of the glacier being 200 m thick, with areas over 350 m thick in the upper regions. We can additionally map the internal reflections within the ice, identifying the boundary between cold and warm ice. This dataset will form a test case in the development of further processing techniques, with the aim of further characterising the glacier-wide englacial water content.